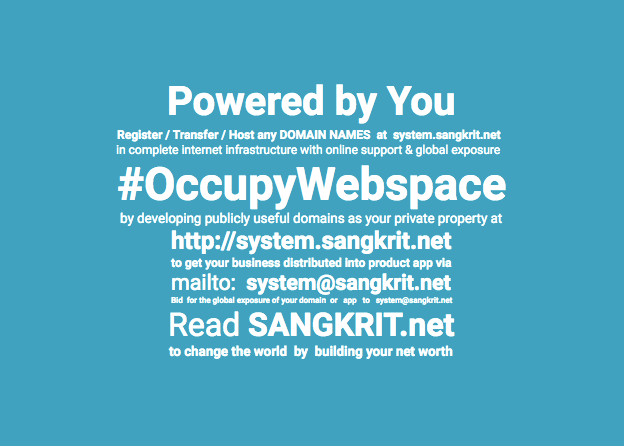 The Internet Growth Engine of SANGKRIT.net insists to get the Internet proclaimed as Special Economic Zone for Free Trade with no other taxation except a 1% Transaction Tax deducted every time a transaction is made online. All the heads of governments are welcome to compete for making the first smart state of internet Age thus possible. @narendramodi …with no other taxation except a 1% transaction tax applied every time a transaction is made online. Children love stories and Animal Farm deserves to be treated as good replacement of grandma stories. The story is still relevant when most of the humanity has yet to go through many political transitions. It is our first book to educate upcoming programmers. We do so to let them build up strong understanding against the organizations based on ideologies that ultimately take away individual freedom. In our course it is the first book now. It is important to keep all the diversity intact upon the Internet. Therefore the best of hackers must always be living responsibly well without ever submitting to the wage slavery of limited liability corporations. Independence of hackathon has not become less important in the Internet age. Continuously consolidating the commonwealth of codebases for selling free software support as an hourly paid independent service to domain registrants is the best way ahead. Selling software as proprietary service is equally bad as selling software as proprietary product is. Men must always be men, authoring their own device drivers. Even android could also get replicated as free software in such a way. Personal media has become the Google’s destiny. Android, Chromebook and Google Glasses have brought Google in to it. The search engine giant Google is now very much in the business of developing personal media. Personal media very effectively enhances individual life. Therefore this succeeds to sustain. Success stories of personal computer, tablet and smart phone are its examples through the digital history. Unlike Facebook Google is getting a much stable future. It might change the way we compute.